You have to pass the CMQ/OE exam to receive the certification from ASQ. To increase the effectiveness of your study and make you familiar with the actual exam pattern, we have prepared this sample questions. 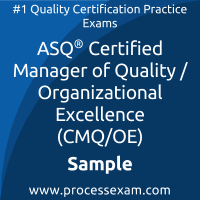 Our Sample ASQ Manager of Quality/Organizational Excellence Practice Exam will give you more insight about both the type and the difficulty level of the questions on the ASQ CMQ/OE exam. However, we are strongly recommending practice with our Premium ASQ Manager of Quality/Organizational Excellence Practice Exam to achieve the best score in your actual ASQ CMQ/OE Exam. The premium practice exam questions are more comprehensive, exam oriented, scenario-based and exact match of ASQ Manager of Quality/Organizational Excellence exam questions. 01. Which of the following is a good tool for planning cycle-time reduction and concurrent operations? 02. A mission statement should meet which of the following requirements? a) It should address only issues of values, beliefs, and philosophies of the organization. b) It should be something currently unachievable, so that the organization will have to stretch itself. c) It should be clear and understandable to all of the organization’s personnel. d) It should be of sufficient length and breadth to cover all aspects of the organization’s business. 03. Which of the following statements is the best example of a tactical plan? 04. An internal quality audit should be designed primarily to answer which of the following questions? 05. Which of the following should happen first when implementing a total quality management (TQM) process? 06. Which of the following actions is NOT used to reduce process cycle time? 07. Which of the following departments provides services primarily to external customers? 08. Which of the following is the best way to ensure that information is conveyed appropriately? 09. Before selecting a supplier as a partner, a customer should do which of the following first? b) Define its own needs. c) Determine which suppliers are industry leaders. d) Get feedback from employees about how various suppliers are performing. 10. In order to be successful, a change agent in a company should do which of the following? a) Understand and respect peoples’ needs. b) Disregard previous unsuccessful efforts to transform the company. c) Maintain allegiance to the traditions and image of the company. d) Keep potentially painful change quiet until it must be communicated.